Wednesday Darrell and I went downtown to Canada Place to celebrate our nationâ€™s birthday. 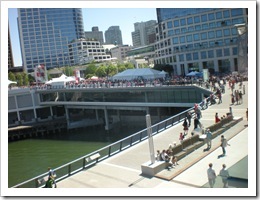 Because Canada Place is undergoing renovations, festivities were held outside. It was a beautiful day for one massive block party! Having spent a few days earlier this year in downtown Chicago, which is wall-to-wall cement and glass, I now appreciate how green Vancouverâ€™s downtown core actually is. I canâ€™t imagine living in a city barren of trees. However, for a â€œgreen-designed, state-of-the-art facilityâ€ that was several hundred million dollars over budget, I was slightly disappointed at the accessibility. Automatic doors were few and far between. Sitting at one door, after several people had walked through without holding it open for us, one well-meaning woman happened by and asked, â€œAre you wanting to go through?â€ No, Iâ€™m just sitting here in front of the door, looking like a dufus, for no reason. She kindly held the door for us. 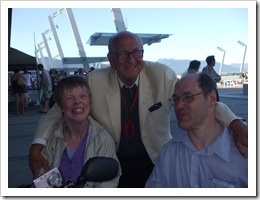 Back outside, we found our way to another stage in time to enjoy Vancouver bandleader legend Dal Richards. Posing for a photo with Dal, after buying his latest CD, was definitely my highlight of the day! The 1st Annual Canada Day Parade was definitely a bummer for us. Despite being on the road, parked right against the curb, while standing spectators were constantly told to back up onto the sidewalk, Darrell and I saw very little of the parade. 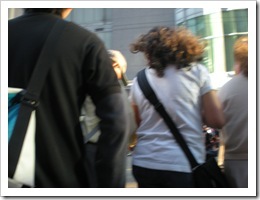 People persistently stood in front of us, with no regard that we could not see. Even after I tapped several on the shoulder and they responded with â€œSorryâ€, they did not move. Very inconsiderate and rude! We are unable to stand to peer over shoulders. Stepping to side would have been a simple way to make the parade accessible to us. It makes me wonder how ready Vancouver really is for the Paralympics. Having had enough of the crowds, we did not stay around for the fireworks. Darell and I look forward to seeing more of the 2nd Annual Canada Day Parade! Cool you got to meet Dal Richards! You would have thought that Sam Sullivan (Mayor of Vancouver at the time) would have pushed to have the Convention Center as accessible as possible. 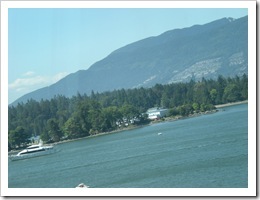 City of Vancouver has the power to develop it’s own building code. Well, those were pretty rude people to have stood right in front of you. Did any of them have nice tushes? Maybe next year you should try the Surrey Canda Day festivities? It was the second largest Canada Day event. 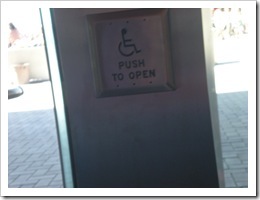 S Emerson, perhaps I’m hypersensitive about accessibility? 😉 I kinda expected this mega project to be ultra accessible. Silly me! 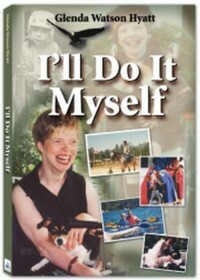 Darrell and I talked about going to Surrey’s event, but its easier for us to get downtown than to Cloverdale by transit. Go figure!